Estrogen receptor β (ERβ) is expressed in the majority of invasive breast cancer cases, irrespective of their subtype, including triple-negative breast cancer (TNBC). Thus, ERβ might be a potential target for therapy of this challenging cancer type. In this in vitro study, we examined the role of ERβ in invasion of two triple-negative breast cancer cell lines. MDA-MB-231 and HS578T breast cancer cells were treated with the specific ERβ agonists ERB-041, WAY200070, Liquiritigenin and 3β-Adiol. Knockdown of ERβ expression was performed by means of siRNA transfection. Effects on cellular invasion were assessed in vitro by means of a modified Boyden chamber assay. Transcriptome analyses were performed using Affymetrix Human Gene 1.0 ST microarrays. Pathway and gene network analyses were performed by means of Genomatix and Ingenuity Pathway Analysis software. Invasiveness of MBA-MB-231 and HS578T breast cancer cells decreased after treatment with ERβ agonists ERB-041 and WAY200070. Agonists Liquiritigenin and 3β-Adiol only reduced invasion of MDA-MB-231 cells. Knockdown of ERβ expression increased invasiveness of MDA-MB-231 cells about 3-fold. Transcriptome and pathway analyses revealed that ERβ knockdown led to activation of TGFβ signalling and induced expression of a network of genes with functions in extracellular matrix, tumor cell invasion and vitamin D3 metabolism. Our data suggest that ERβ suppresses invasiveness of triple-negative breast cancer cells in vitro. Whether ERβ agonists might be useful drugs in the treatment of triple-negative breast cancer, has to be evaluated in further animal and clinical studies. Ten to twenty percent of all breast cancers are triple-negative breast cancers (TNBC) . 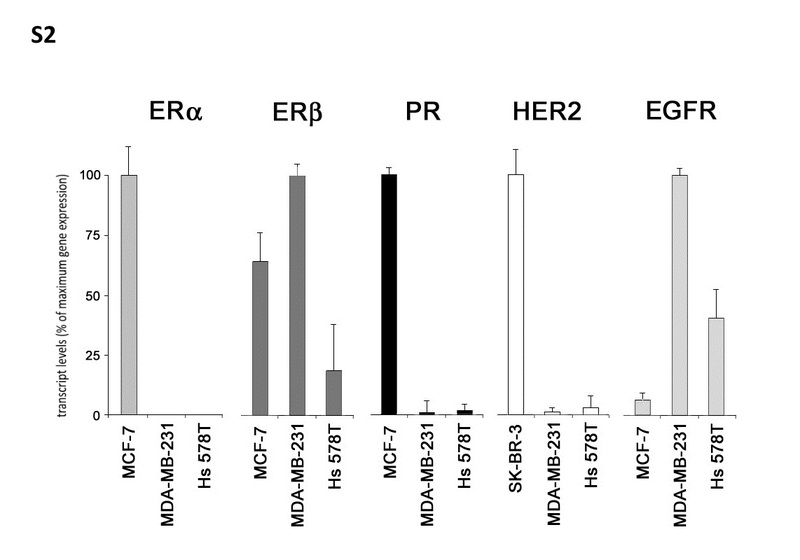 This breast cancer subgroup lacks expression of estrogen receptor alpha (ERα) and progesterone receptor (PR) as well as human epidermal growth factor receptor 2 (HER2) amplification. TNBCs are more frequent in younger patients and tumors are generally larger in size. Moreover, TNBCs are more aggressive, of higher grade and often have lymph node involvement at diagnosis [1, 2]. As patients with TNBC do not benefit from targeted therapies with tamoxifen or trastuzumab [3–5], they have a poorer prognosis and a higher rate of distant recurrence than women with other breast cancer subtypes [2, 6]. Less than one third of women with metastatic TNBC survive 5 years, and almost all die of their disease despite adjuvant chemotherapy . Most of TNBCs can be classified as basal-like either by immunohistochemistry or by correlation to the intrinsic molecular breast cancer subtypes [7–9]. Basal-like tumors express markers of the myoepithelium of the normal mammary gland, like epidermal growth factor receptor (EGFR), p63 and the basal cytokeratins CK14, CK5/6 and CK17 [10, 11]. In contrast to estrogen receptor α (ERα), the second estrogen receptor, ERβ has been shown to be expressed in all molecular subtypes of breast cancer, including 60% of basal-like tumors . Thus, ERβ could be an interesting therapy target for patients with TNBC. ERβ has been suggested to act as a tumor-suppressor in breast tissue, because its expression declines during carcinogenesis, its knockdown increased proliferation of mammary epithelial and breast cancer cells, whereas its overexpression inhibited tumor cell proliferation [13–17]. Previously, ERβ status has been reported to affect clinical outcome of TNBC . However, the role of ERβ in regulation of breast cancer cell invasiveness is only beginning to be understood. Previously, ERβ has been reported to enhance adhesion of ERα-positive breast cancer cells by increase of integrin expression . A recent study reported that ERβ was able to repress epithelial to mesenchymal transition and invasion of basal-like breast cancer cells by destabilizing EGFR . In this study, we further approached the role of ERβ in invasiveness of TNBC cells. We knocked down ERβ in TNBC cells and performed transcriptome and gene network analyses to elucidate, whether genes with functions in tumor cell invasion would be regulated. Additionally, we examined whether treatment with ERβ agonists would affect invasiveness of TNBC cell lines in vitro. Phenol red-free DMEM culture medium was obtained from Invitrogen (Karlsruhe, Germany), FCS was purchased from PAA (Pasching, Austria). MDA-MB-231 and HS578T breast cancer cells were obtained from American Type Culture Collection (Manassas, USA). RNeasy Mini Kit was obtained from Qiagen (Hilden, Germany). Transfectin reagent was obtained from BioRad (Hercules, USA). OptiMEM medium were purchased at Invitrogen (Karlsruhe, Germany). ESR2 and control siRNAs were from Ambion (Life Technologies, USA). Serum Replacement 2 (SR2) cell culture supplement was from Sigma-Aldrich (Deisenhofen, Germany). ERβ agonists ERB-041 and WAY-200070 were from Tocris (Bristol, UK). 5α-androstane-3β, 17β-diol (3β-Adiol) was from Sigma (Deisenhofen, Germany) and Liquiritigenin from Extrasynthese (Lyon, France). 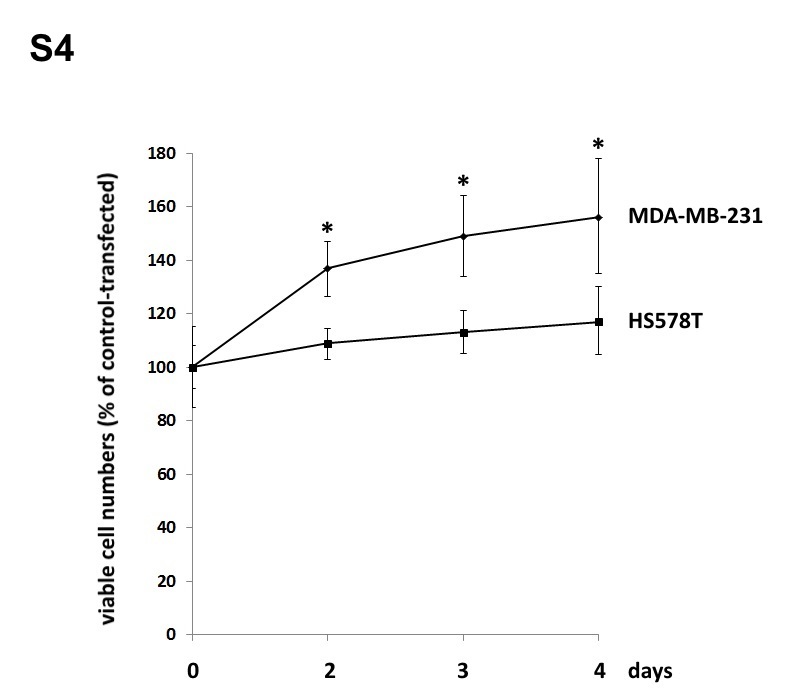 MDA-MB-231 and HS578T cells were maintained in DMEM/F12 medium supplemented with 10% FCS. Cells were cultured with 5% CO2 at 37 °C in a humidified incubator. For transfection, 4 × 105 cells per well of a 6-well dish were seeded in DMEM/F12 containing 10% FCS. The next day, 2 ml fresh culture medium was added to the cells, transfection solution was prepared in OptiMEM medium (Invitrogen) using 5 μl Transfectin reagent (BioRad) and a mix of three ESR2 siRNAs (10 nM each) (or 10 nM of siRNA specific for CYP24A1, CXCL14 or negative control siRNA) and was added to the cultured cells. The siRNA mix contained three different ESR2-specific Silencer siRNAs (siRNA IDs 145909, 145910, 145911, Ambion), targeting exons 1, 2 and 3 of ESR2 mRNA. For knockdown of CYP24A1 and CXCL14, further Silencer siRNAs were used (siRNA IDs 106233 and 137806, respectively, Ambion). As a negative control, Silencer Negative control siRNA #1 (Ambion) was used. Gene knockdown of ESR2, CYP24A1 and CXCL14 was verified by means of Western blot analysis 72 h after siRNA treatment as described below. For cell proliferation assays, cells cultured in DMEM/F12 supplemented with 10% FBS were seeded in 96-well plates in triplicates (1000 cell/well). On days 0, 2, 3 and 4 relative numbers of viable cells were measured using the fluorimetric, resazurin-based Cell Titer Blue assay (Promega) according to the manufacturer’s instructions at 560Ex/590Em nm in a Victor3 multilabel counter (PerkinElmer, Germany). Cell growth was expressed as percentage of day 0. Growth data were statistically analyzed by the Kruskal–Wallis one-way analysis of variance. Tumor cell invasion was measured by assessment of breast cancer cell invasion through an artificial basement membrane using the 24-well Cultrex BME cell invasion assay (Trevigen, USA), a modified Boyden-chamber transwell assay with 8 μm pore size, according to the manufacturer’s instructions. BME (basement membrane extract) is a soluble form of basement membrane purified from Engelbreth-Holm-Swarm (EHS) tumor, mainly consisting of laminin, collagen IV, entactin, and heparin sulfate proteoglycan. Briefly, 100 μl ice-cold liquid BME extract (10 mg/ml) was placed on top of the insert membranes and polymerized at 37 °C over night to form a reconstituted basement membrane gel of about 3 mm thickness. 50000 MDA-MB-231 or HS578T cells (plus/minus ERβ agonists, calcitriol or CXCL14 chemokine) or the same number of cells previously transfected with siRNA specific for ESR2, CYP24A1 or CXCL14, serum starved in SR2 medium, were seeded the day after treatment (or 2 days after treatment with the ERβ agonists) on top of the BME coated inserts. The lower compartment was filled with 600 μl of DMEM-F12 supplemented with 10% FCS as a chemoattractant. After 48 h of invasion in a humidified incubator with 5% CO2 at 37 °C, relative numbers of cells invaded into the bottom chamber were relatively quantified using the fluorimetric Cell Titer Blue assay (Promega) as described above. As negative controls, samples without chemoattractant were measured. Cell proliferation used for calculation of the corrected invasion rate was determined in parallel experiments using the same assay. Total RNA was isolated from 30 to 80 mg frozen tissue or from cell lines (106 cells) by means of Trizol reagent (Invitrogen, Karlsruhe, Germany) according to manufacturer’s protocol. RNA purity and concentration was analyzed by spectrophotometry. From each sample, 500 ng of total RNA was reverse transcribed to cDNA using 40 units of M-MLV Reverse Transcriptase and RNasin (Promega, Mannheim, Germany) with 80 ng/μl random hexamer primers (Invitrogen, Karlsruhe, Germany) and 10 mM dNTP mixture (Fermentas, St. Leon-Rot, Germany) according to the manufacturer’s instructions. After reverse transcription, specific transcript levels were determined by real-time PCR. For this purpose, 4 μl of cDNA were amplified using LightCycler® FastStart DNA MasterPLUS SYBR Green I (Roche Diagnostics GmbH, Mannheim, Germany) and 5 mM of each primer (Additional file 1: File S1). Oligonucleotides (Metabion, Planegg-Martinsried, Germany) were designed intron-spanning to avoid genomic contaminations. Real-time PCRs were carried out in a LightCycler® 2.0 Instrument (Roche, Mannheim, Germany) under the following conditions: initial denaturation at 95 °C for 15 min, followed by 45 cycles with 10 s denaturation at 95 °C, 5 s annealing at 60 °C and 12 s extension at 72 °C. The PCR program was completed by a standard melting curve analysis. Negative controls were prepared by adding distilled water instead of cDNA. To verify the identity of the PCR products, they were initially analyzed by electrophoresis in 1.5% agarose gels and stained with ethidium bromide. After size check, each PCR product was then purified using the “QIAquick Gel Extraction Kit” (Qiagen, Hilden, Germany), following the manufacturer’s protocol and verified by sequencing (Eurofins MWG Operon, Ebersberg, Germany). In all RT-PCR experiments, a 190 bp β-actin fragment was amplified as reference gene using intron-spanning primers actin-2573 and actin-2876. Data from two independent PCR experiments per sample were analyzed using the comparative ΔΔCT method  calculating the difference between the threshold cycle (CT) values of the target and reference gene of each sample and then comparing the resulting Δ CT values between different samples. Seventy-two hours after transfection, MDA-MB-231 were lysed in RIPA buffer (1% (v/v) Igepal CA-630, 0.5% (w/v) sodium deoxycholate, 0.1% (w/v) sodium dodecyl sulphate (SDS) in phosphate-buffered solution (PBS) containing aprotonin and sodium orthovanadate. Aliquots containing 10 μg of protein were resolved by 10% (w/v) SDS–polyacrylamide gel electrophoresis, followed by electrotransfer to a PVDF hybond (Amersham, UK) membrane. Immunodetection was carried out using monoclonal ESR2 antibody 14C8 (1:500), (ab288, Abcam, Germany), CYP24A1 polyclonal antibody (ab175976, Abcam, Germany) diluted 1:300 in PBS containing 5% skim milk (w/v), polyclonal CXCL14 antibody (1:250) (ab36622, Abcam, Germany), monoclonal tenascin-c antibody [EPR4219] (1:500) (ab108930, Abcam, Germany), polyclonal MMP13 antibody (1:1000) (ab39012, Abcam) and β-actin antibody (1:500) (ab8226, Abcam) followed by horseradish peroxidase conjugated secondary antibody (1:20000) which was detected using chemiluminescence (ECL) system (Amersham, Buckinghamshire, UK). The Western blot results from three independent protein isolations were densitometrically analyzed (ImageJ, NIH) and expressed in percentage of cell transfected with negative control siRNA. Processing of four RNA samples (two biological replicates from MDA-MB-231 cells transfected with ESR2 siRNAs or control siRNA as described above) was performed at the local Affymetrix Service Provider and Genomics Core Facility, “KFB - Centre of Excellence for Fluorescent Bioanalytics” (Regensburg, Germany; www.kfb-regensburg.de). Sample preparation for microarray hybridization was carried out as described in the Affymetrix GeneChip® Whole Transcript (WT) Sense Target Labelling Assay manual. 300 ng of total RNA were used to generate double-stranded cDNA. Subsequently synthesized cRNA (WT cDNA Synthesis and Amplification Kit, Affymetrix) was purified and reverse transcribed into single-stranded (ss) DNA. After purification, the ssDNA was fragmented using a combination of uracil DNA glycosylase (UDG) and apurinic/apyrimidinic endonuclease 1 (APE 1). Fragmented DNA was labelled with biotin (WT Terminal Labelling Kit, Affymetrix), and 2.3 μg DNA were hybridized to the GeneChip Human Gene 1.0 ST Array (Affymetrix) for 16 h at 45 °C in a rotating chamber. Hybridized arrays were washed and stained in an Affymetrix Washing Station FS450 using preformulated solutions (Hyb, Wash & Stain Kit, Affymetrix), and the fluorescent signals were measured with an Affymetrix GeneChip® Scanner 3000-7G. Summarized probe signals were created by using the RMA algorithm in the Affymetrix GeneChip Expression Console Software and exported into Microsoft Excel. Data was then analysed using Ingenuity IPA Software (Ingenuity Systems, Stanford, USA) and Genomatix Pathway Analysis software (Genomatix, Munich, Germany). Genes with more than 2-fold changed mRNA levels after ERβ knockdown in both biological replicates were considered to be differentially expressed and were included in the analyses. First we tested receptor expression of MDA-MB-231 and HS578T cells to characterize the cell culture models employed in this study. For comparison we included MCF-7 cells, known to express ERs and PR and also SK-BR3 cells, which overexpress HER2. MDA-MB-231 and HS578T cells did only express extremely low or even undetectable mRNA levels of ERα, PR or HER2, as expected from triple-negative breast cancer cells. In contrast, they strongly expressed EGFR mRNA. ERβ transcript levels were higher in MDA-MB-231 cells than in MCF-7 and HS578T cells (Additional file 2: Figure S2). The employed cell lines MDA-MB-231 and HS578T had a comparable invasion capacity (Additional file 3: Figure S3). To examine the role of ERβ in invasion of TNBC cells, we first treated both cell lines with a panel of four ERβ agonists. Treatment with all ERβ agonist decreased invasion of MDA-MB-231 cells and, to a lesser extent, of HS578T cells. While we tested agonist concentrations from 10 nM to 10 μM, only treatment with 10 nM of ERβ agonists had a statistically significant effect on invasion of MDA-MB-231 cells. Ten nanometre of ERB-041 decreased invasion down to 39.8% (p < 0.05), 10 nM of WAY200070 reduced invasion down to 37.1% (p < 0.05), 10 nM of 3β-Adiol down to 42.8% (p < 0.05) and the same concentration of Liquiritigenin decreased invasion down to 53.5% (p < 0.05). In contrast, invasiveness of HS578T cells expressing lower levels of ERβ was only inhibited by the highest concentration of ERB-041 and WAY-200070 (10 μM), but was not affected by the other two agonists (Fig. 1). None of the ERβ agonists tested did affect proliferation of these cell lines in a significant manner (data not shown). We now wanted to find out whether knockdown of ERβ would in turn be able to induce breast cancer cell invasion. Given that MDA-MB-231 cells turned out to be much more sensitive to ERβ agonists, and had a higher expression of this receptor, we chose this cell line for knockdown of ERβ. Seventy-two hours after transfection with ERβ-specific siRNAs, a maximum suppression of total ERβ transcript levels down to 11.8% was observed (data not shown). Western blot analysis confirmed knockdown of ERβ protein expression after 72 h of transfection (Fig. 2a). Using these ERβ knockdown cells together with cells transfected with negative control siRNA, we performed further in vitro invasion assays to examine the action of this gene in TNBC cell invasion. To be sure that ERβ expression was significantly reduced during the whole invasion assay, MDA-MB-231 cells were seeded onto the basement membrane 24 h after siRNA transfection, and invasion was measured after further 48 h. MDA-MB-231 cells transfected with ERβ siRNA showed an about 3-fold higher invasion level than cells treated with negative control siRNA (Fig. 2b). With regard to cell proliferation, only knockdown of ERβ in MDA-MB-231 cells, but not in HS578T cells significantly accelerated proliferation (Additional file 4: Figure S4). To elucidate the molecular mechanisms underlying the effect of this receptor on TNBC invasion, we examined the effect of an ERβ knockdown on transcriptome of MDA-MB-231 cells. For this purpose, we compared the transcriptome of these knockdown cells with MDA-MB-231 cells transfected with negative control siRNA by DNA microarray analysis (Affymetrix Human Gene 1.0 ST Arrays). Transcript levels of 55 genes were found to be induced more than 2-fold, whereas 16 genes were more than 2-fold decreased in MDA-MB-231 cells transfected with ERβ siRNA (Table 1). Additional Western Blot analyses were performed which were able to corroborate upregulation of CYP24A1, MMP13 and TNC on the protein level in ERβ knockdown cells (Fig. 3). Microarray data were then processed using Genomatix Software Suite (Genomatix Software, Munich, Germany) and Ingenuity Pathway Analysis software (IPA, Ingenuity Systems, USA). With regard to localization in cellular components, Genomatix software revealed that as much as 20 of the upregulated genes were associated with the Gene Ontology (GO) term extracellular region, among them five genes coding for extracellular matrix proteins and ten genes with known functions in the extracellular matrix (Table 2). Analysis of the data with regard to the GO domain molecular function revealed that beside proteins TGFB1 and B2 being ligands for transforming growth factor receptors, other regulated genes coded for proteins being able to bind to fibronectin, lipoprotein particle receptors, insulin-like growth factor receptors or cytokine receptors. With regard to biological processes, the regulated genes were found to be associated with assembly or organization of the extracellular matrix, but also with tissue morphogenesis, apoptosis, cell adhesion and migration. A set of genes was known to be regulated in response to steroid hormones like estrogens (Table 2). By means of Genomatix Pathway Analysis software, the genes regulated by ERβ knockdown in MDA-MB-231 cells could be connected by a network of genes known to be regulated by TGFB1 (Fig. 4). Further analyzes of the microarray data by means of Ingenuity Pathway Analysis software (IPA, Ingenuity Systems) generated a second gene network including involvement of estrogen signaling (Fig. 5). Given that CYP24A1 and CXCL14 were the top upregulated genes, we further examined their role in MDA-MB-231 breast cancer cell invasion. For this purpose, we knocked down their expression by means of siRNA transfection and examined the effect on invasion of MDA-MB-231 cells. Three days after siRNA transfection, specific protein levels were reduced by 89.4% (CXCL14, p < 0.01), or 82.1% (CYP24A1, p < 0.01), respectively (Fig. 6a, upper panel). Three days after siRNA transfection, knockdown of CYP24A1 gene resulted in significant inhibition of invasiveness down to 45.6% (p < 0.01), and knockdown of CXCL14 expression decreased MDA-MB-231 cell invasion down to 41.0% (Fig. 6a, lower panel). To corroborate the data generated by knockdown of CYP24A1 and CXCL14, we treated this cell line with calcitriol or CXCL14 chemokine the day before and during the invasion assay. Calcitriol (10 nM) reduced invasion of MDA-MB-231 breast cancer cells by 59.8%, and CXCL14 (10 ng/ml) increased their invasiveness up to 151.9% (Fig. 6b). In this study, invasiveness of TNBC cells in vitro was found to decrease after treatment with ERβ agonists, but increased after knockdown of this gene. The results of our study clearly suggest that ERβ might be able to suppress invasion of certain breast cancer cells in an ERα-independent manner. Although the role of ERβ in breast cancer is only beginning to be understood, an increasing amount of evidence suggests that this receptor might exert tumor-suppressor functions [13–17]. If this is the case, activation of ERβ by specific agonists might be a feasible treatment option for breast cancer. In this study, we tested four ERβ agonists which have been reported to bind preferentially to this receptor, but only to a much smaller extent to ERα. Given that the employed cell lines were ERα-negative, the observed agonist effects most likely were mediated by ERβ. The dihydrotestosterone metabolite 5α-androstane-3β, 17β-diol (3β-Adiol) is an androgen derivative which does not bind androgen receptors, but efficiently binds ERβ, and its serum concentration is known to decline in the second half of life . 3β-Adiol acts as a physiological ERβ-activator in different tissues [23, 24]. In line with our data, 3β-Adiol has been reported to inhibit cellular migration and epithelial-mesenchymal transition of prostate cancer cells as well as to reduce tumor progression [22, 25]. ERB-041 and WAY-200070 are highly specific synthetic ERβ agonists [26, 27]. ERB-041 is known to display a more than 200-fold selectivity for ERβ than for ERα (EC50 ERβ = 2 nM), WAY-200070 still has a 68-fold higher selectivity for ERβ than for ERα (EC50 ERβ = 2 nM) . Liquiritigenin is a plant-derived flavonoid from licorice root, which acts as a highly selective agonist of ERβ (EC50 ERβ = 36.5 nM) . Previously, Liquiritigenin and 3β-Adiol have been reported to inhibit proliferation of different breast cancer cell lines except of TNBC cell line MDA-MB-231, while the agonists WAY200070 and ERB-041 did not affect proliferation of ERα-positive breast cancer cells lines [30, 31]. The fact that invasiveness of HS578T cells was only sensitive to high ERβ agonist concentrations might be explained by the significantly lower ERβ expression levels observed in this cell line. Our observation that only lower concentrations of the ERβ agonists were able to reduce invasion of MDA-MB-231 cells is in line with the agonists EC50 values for ERβ, which all are in the low nanomolar range. Pathway analyses of the microarray data revealed induction of several genes coding for components or regulators of the extracellular matrix after knockdown of ERβ in MDA-MB-231 cells. Many genes regulated after treatment with ERβ siRNA could be identified to exert important functions in cell adhesion, cell migration and tumor cell invasion. Most of these genes are known targets of TGFβ like MMP13, TNC, IGFBP7 and LOX [32–34]. Due to the assessed transcriptome changes and upregulation of TGFB1 and TGFB2 itself, it is suggested that knockdown of ERβ resulted in activation of TGFβ1/2 signaling, which resulted in induction of genes with known functions in extracellular matrix and tumor cell invasion (Fig. 5). TGFβ signaling previously has been shown to induce motility and invasion of breast cancer cells [35–40]. TNC, whose expression was shown to be significantly induced after knockdown of ERβ both on the mRNA and protein level, is known to exert important functions in tumor cell invasion. TNC gene codes for the large extracellular matrix glycoprotein tenascin-c that shows prominent stromal expression in many solid tumors and has been reported to promote invasion of tumor cells of different origin, including breast cancer cells by matrix metalloproteinase-dependent and -independent mechanisms [41–47]. MMP13 gene, the expression of which was induced more than 3-fold after ERβ knockdown, codes for matrix metalloproteinase 13 (collagenase 3), a protease originally identified in breast carcinoma, which is also known to promote tumor cell invasion and has been previously reported as a molecular marker for transition of ductal carcinoma in situ lesions to invasive ductal carcinomas . The observed activation of CYP24A1 gene coding for a mitochondrial enzyme which degrades 1,25-dihydroxyvitamin D3 into biologically inactive metabolites is another key event triggered by ESR2 knockdown. The complementary effects of CYP24A1 gene knockdown and treatment with calcitriol on invasion we observed corroborate the proposed key role of this gene in our study. CYP24A1 antagonizes the antitumoral actions of this vitamin and is known to be overexpressed in breast cancer tissue [49, 50]. The observed upregulation of CYP24A1 mRNA and protein after knockdown of ERβ is proposed to be one important reason for the increase of MDA-MB-231 cell invasiveness, because 1,25-dihydroxyvitamin D3 is known to reduce invasion, motility and metastasis of cancer cells (reviewed in ). Though we did not measure the exact concentration of 1,25-dihydroxyvitamin D3 in the fetal calf serum we used for cell culture, it is well known that serum contains calcitriol. Given that this vitamin is known to suppress expression of tenascin-c, the upregulation of this ECM component we found both on the mRNA and protein level most probably is the consequence of the elevated CYP24A1 expression we observed . The strongly induced chemokine CXCL14 is known to exert both tumor-suppressive and tumor-promoting effects in mammals. While it primarily acts as a chemo-attractor for macrophages, dendritic cells and natural killer cells, CXCL14 is also able to act as a pro-tumorigenic factor. In line with our findings, CXCL14 has been previously reported to promote motility and invasion of breast and prostate cancer cells and bone metastasis of lung cancer cells [53–55]. CXCL14 has previously been reported to be induced by steroid hormones like progestin, but the mechanism linking ERβ and CXCL14 remains to be elucidated . Pathway analyzes finally generated a gene network which might be able to at least partially elucidate the connection between ERβ knockdown and the transcriptome changes we observed (Fig. 6). Expression of the genes CYP24A1 and MMP13 has previously been reported to be activated by estrogens [57, 58]. Thus, it is tempting to speculate that repression of ERβ - knowing to act as an ERα antagonist in certain settings - might increase estrogen-triggered expression of MMP13 and CYP24A1 mediated by ERα. Expression of TGFβ, a key molecule of the generated network is also known to be regulated by estrogens, but this interaction seems to be more complex. Whereas some studies reported activation of TGFβ expression by estrogens, others found inhibitory effects of this steroid hormone particularly on expression of TGFB2 [59, 60]. Thus, the molecular mechanisms underlying the observed activation of TGFβ-expression and -signaling triggered by knockdown of ESR2 gene remain to be elucidated. In conclusion, the observed effects of an ERβ knockdown and of treatment with ERβ agonists on breast cancer cell invasion were consistent and clearly suggest that this receptor inhibited invasion of the employed TNBC cells in vitro. Transcriptome and gene network analyses provided molecular mechanisms which might underlie the observed alteration of invasion. Whether ERβ agonists might be suitable for treatment of triple-negative breast cancer, has to be evaluated in further animal and clinical studies. This study was supported by Deutsche Krebshilfe (German Cancer Aid, grant 109564). The datasets supporting the conclusions of this article are including within the article and its additional files. SST made substantial contributions to conception and design of data and interpretation of data. JH made substantial contributions to acquisition of data. EI has been involved in revising the manuscript critically for important intellectual content. CM made substantial contributions to acquisition of data. OO has been involved in revising the manuscript critically for important intellectual content. OT made substantial contributions to conception and design, acquisition of data analysis and interpretation of data. All authors read and approved the final manuscript.